This was my uncle. This car was campaigned in the first Daytona 500 race in 1959. 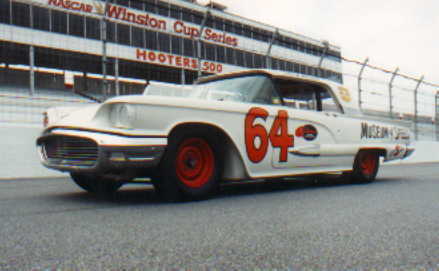 The #64 Holman-Moody Thunderbird was the car driven by Fritz Wilson who finished in 56th place with a blown piston. He actually only made 15 laps before leaving the race. The car that finished in 2nd place was driven by Johnny Beauchamp in the #73 car. In a photo finish #73 was initially declared the winner. The #64 car still exists and can be found in Mark Martins Klassix Car museum in Daytona Beach , FL. I won`t be around for awhile, Mark. I`m in the process of a move. I will contact you later after the new year. Hello Mark, sorry about taking so long to respond. I`m not sure if I can help you find what you are looking for, but I will surely try my best to see what I can find out. Hi Tim, you still there? My name is Mark Mundorff and I am in Lincoln Ne. I bought a 59 Tbird in 1967 that was called the Daytona Special. I cannot find any history on it. It is not a std T~Bird. It has been modified in both body and engine and transmission. It has the 430 engine, 3 speed overdrive and side vents to let air escape from the engine area at high speed. It has no power assecories at all. It is all engine and transmission and had traction bars welded underneath. ? ?